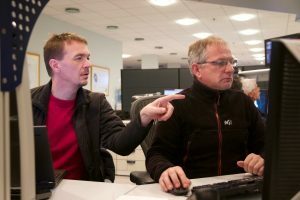 The successful commissioning of the last avatar of MUSE, the MUSE Narrow Field Mode, conclude the series of commissioning of MUSE which started four years ago, after MUSE first light in January 2014. 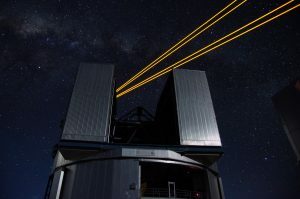 This last blog, 17 years after the ESO call for idea for the 2nd generation VLT instrument, mark the end of a great scientific, technical and human story. Such event happens only once in a career. I have been lucky to live this. I consider a privilege the possibility which was given to me to share with so many talented and enthusiastic people, the pleasure to create a new and unique instrument leading to many scientific discoveries. 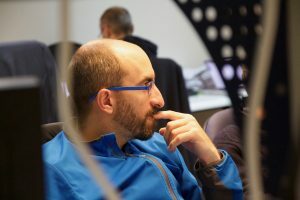 I have learned along these years that the most important is not the technical and scientific expertise, but the willingness to work together, focused on the same goal, with the belief that everyone, whatever his role, can contribute. I wish to every instrument builder the same joy I had to see my ideas becoming a real project and then a successful instrument that is used by many. The best is achieved when your creation does not belong anymore to you but is the common resource of many. 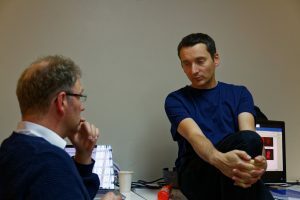 The community is now using MUSE in a way which was not always foreseen in the original science case and this may be the most successful part of this story: the capability which is given tor each user to express its creativity to address the key scientific questions we have about our Universe. 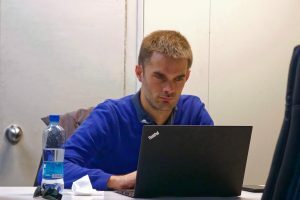 Although this is the last blog which relate the MUSE commissioning activities, I am not fully done with the project and I hope to continue to help in a way or the other to make the best science out of it. Thank you my friends, it has been such a fantastic experience. I wish you all the best and a long life to our MUSE which certainly will continue to inspire us for many years. Jarle and Peter discussing show case targets after the 4 pm daily meeting at the residence. Pascale and Fernando looking to the operation schedule. The last night of this last commissioning run was also the night of the winter solstice, the longest night of the year, with more than 14 hours of darkness. A great perspective for doing many good observations if the atmosphere collaborate, or a long agony if the turbulence is too strong or if the system does not work. 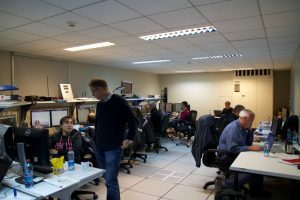 But, after many nights of poor seeing, a measure of the atmospheric turbulence, an essential ingredient for the successful operation of the LTAO, Paranal’s God gave us an excellent and stable seeing all over night. Elena is preparing the user manual. After all the tests and modifications performed during the previous night, the goal of this last night was to check that we can operate smoothly the system. And indeed, this is what happen. We have been going from a showcase target to another one, closing the loop without any problem. In a beautiful synergy, MUSE and GALACSI worked perfectly together, moving from the wide field mode to the narrow filed mode and vice-versa in just a click and a few minutes. Johann, Pierre-Yves and Thierry are discussing low wind effect. Time for a sandwich. 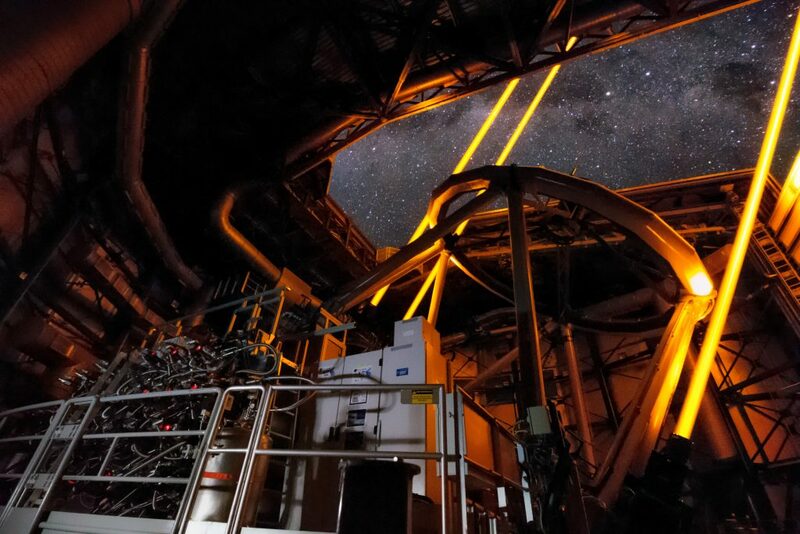 Walking on the platform from the VLTI control room to the main control room building , one can admire the magnificence of the galactic center, almost at zenith, with its billions of stars shining in the dark while the laser ballet draw some enigmatic figures on it. Back to the control room. Spectacular high resolutions images appear on the screen provoking some excitement in the room. The disk fills up slowly with gigabytes of precious data. Everybody is happy, we will have plenty of new materials to use for the upcoming ESO press release. 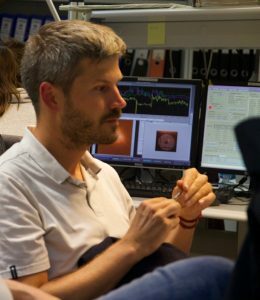 After a short live session with the MUSE GTO science team, who is meeting in Hendaye (France) at the same time, we end the night with some spectrophotometric standards stars and a last performance measurement of the achieved image quality. While the sun sets, the group, tired after this long night, drove back to the residencia for a short sleep before leaving Paranal. The double nuclei galaxy NGC 6240, observed with MUSE and HST. On the left panel one can see the Wide Field Mode observations, zoomed on the central part. In the center the two panels display the HST WFPC2 and ACS images and on the right panel the Narrow Field Mode observation. As it can be seen MUSE NFM achieve a spatial resolution comparable to the HST, but the main difference is that MUSE provide a full data cube rather than just an image. The data cube contains much more information such as chemical composition and kinematics. It is a long time we have not been in touch. I have been too busy, let’s say also a bit lazy, and did not cover much of the on-going activities during the last 6 months. It is time to give you some fresh news. 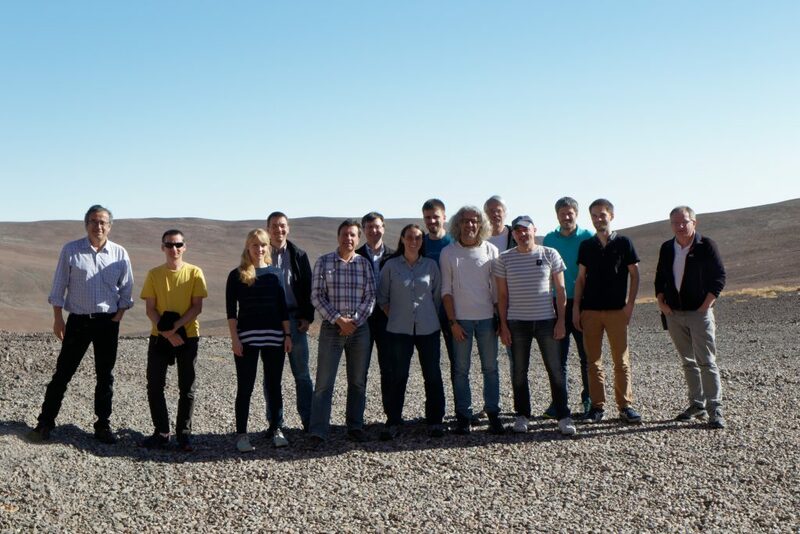 We have already been in Paranal in April and we are back again for another exciting time: the commissioning of MUSE narrow field mode. The narrow field mode, say NFM if you want to be trendy, or Laser Tomography Adaptive Optics assisted Integral Field Spectrograph if you want to impress the audience, is the last metamorphose of MUSE in its cycle of life. In this mode, MUSE zooms (x 8) to a smaller field of view to get exquisite details of astrophysical sources. However zooming is not enough if at the same time you do not improve the image quality. 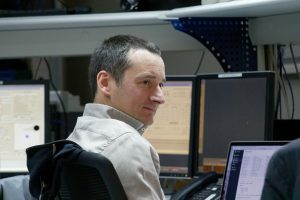 To achieve this, MUSE is assisted by the fantastic machinery of the Adaptive Optics Facility which we already have used to improve MUSE image quality. But this time, it is far more ambitious, the goal is to correct the whole atmospheric turbulence above the telescope and to obtain image as if they would have been taken from space. The team of April commissioning. From left to right: Fernando, Joel,Dominika, Peter, your humble servant, Ralf, Pascale, Sebastian, Philippe, Pierre-Yves, Sylvain, Benoit, Simon and Gérard. Daily meeting at the residencia before leaving for the summit. The group is contemplating the impressive results obtained on the center of a globular cluster. This is the holy grail of our talented team of AO wizards. They have been working more than ten years to make this happen and now, the time has come to confront the dreams with the reality. We are all there, impatient, excited, a bit anxious, to see the new beast in operation. During 5 nights of the April run, we played the laser game, closing millions of loops, and got hundreds of data cubes of all sort of objects. We went back to Europe with our pockets full of star’s images and point spread functions to analyse. And now we are back, for the second and final run. 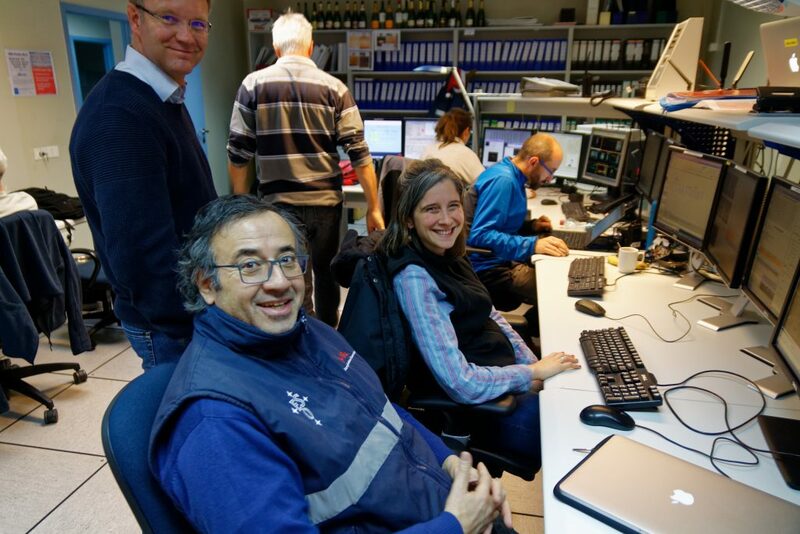 During these long night of the austral winter we will finalise the instrument operations and measure its performance before it can start science operations. The plan is also to take a few showcases to demonstrate that indeed we can send MUSE outside the atmosphere. 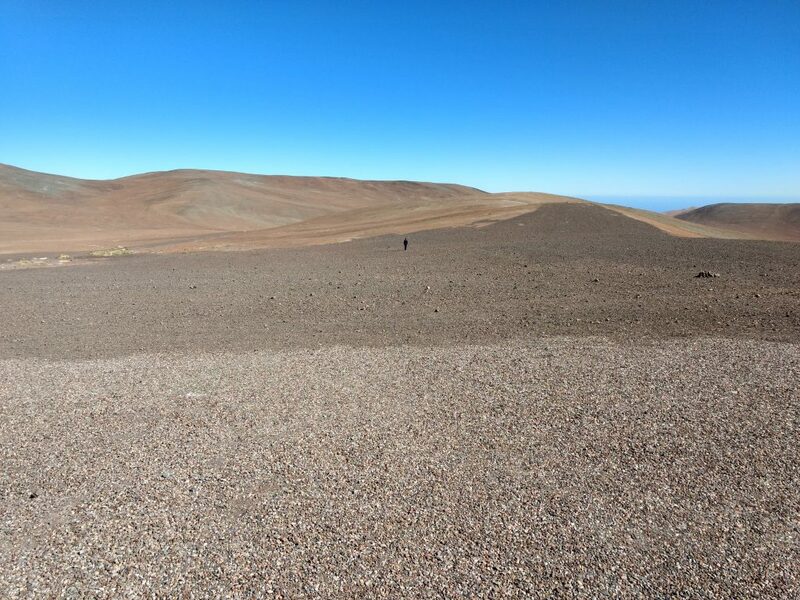 As almost each evening, I am contemplating the magical transformation of the Paranal landscape into a subtle collection of reds, oranges and browns while the sky turns to deep blue. This is also the time of question and expectation: what seeing, how much ground layer and wind tonight ? The program is ready, we will start with the quasar and then move to other interesting objects before finishing to the now obligatory on/off sequence, now nickname snake. But as a sailing boat does not decide on the direction and strength of the wind, observation at a ground based telescope has to cope with some part of unpredictability, some hasard, which is inherent to the atmospheric behaviour. Indeed, at start, we were not able to point to the quasar because of pointing restriction due to strong wind from the East. This was unexpected because most of the time the strong winds come from the North and thus two days ago we changed on purpose to a South target to be on the safe side. We had to wait that the object pass meridian and in the meantime perform a snake sequence to measure the AO performance. Seeing was terrible, almost 2-3 arc second but the system manage to put it back to 1.2-1.5 arc second, not great though in absolute terms. When it was possible we then moved to the quasar, but the measured image quality was even poorer. Even if the AOF was still closing all the loops, the image quality indicator went off the high limits and disappear from the monitoring screen ! We still performed the expected exposures but with such a poor image quality we were not sure what will be coming out of it. Outside, wind was blowing like a hell and the ground layer vanished, AOF was desesperatly trying to keep the tip/tilt star in its box. In an heroic attempt, we keep trying to perform some measurements all nights, but at 4 a.m we decide to leave the boat. The Ultra Luminous Infrared galaxy ESO 148-G002 observed with and without AO (images Peter). In the meantime, as a consolation, Peter processed the date obtained the previous night on the ULIRG and produced a beautiful image that we are happy to share with you. Look to the finer detail and improved sharpness when comparing with an early observations obtained a few years ago at the science verification. After a good sleep and a quick breakfast, it is time for all of us to debrief at the meeting room of the residencia. Despite the poor weather of the last nights, we have been able to perform all key tests and improved the system. A first evaluation of the performance demonstrate that our expectation are met. What was almost a dream 16 years ago is now a palpable reality. With our data in hands we can say that image sharpness that were extremely rarely measured in MUSE or even impossible to obtain, will be obtain in normal conditions, say more than 50% of the time. Moreover, in average, the worst the atmospheric conditions, the better the improvement, resulting in a much higher probability for the science user to obtain excellent image quality, even for very long integration. Of course, this must be confirmed in the long term by using the system in various atmospheric conditions, but it is likely that the combination of MUSE and AOF will improve the quality of the produced MUSE datacubes and, ultimately, boost the scientific productivity. 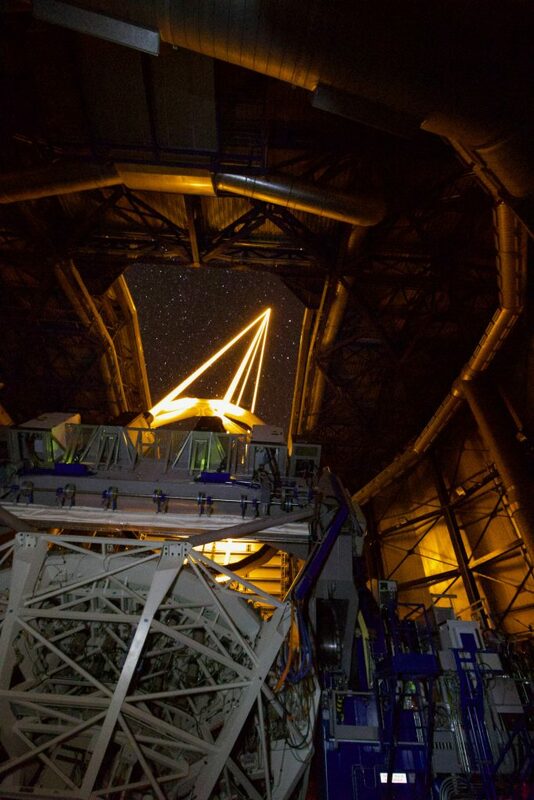 One of the most complex systems ever build for an optical ground based telescope is now at our disposal. We are all excited and impatient to use it to question the Universe and get more hints and insights to try to answer its many mysteries. On behalf of present and future users that will have a chance to get access to this great facility, I would like to thank all of you, and you are many, that have been part of this great technical and scientific development. It is a unique and major collective achievement, you can be proud of it. This last night marks the end of the MUSE plus GALACSI commissioning. It has been a privilege and an immense pleasure to share with you, commissioning companions, these two runs. There are no successful scientific and technical achievement which is not also a human successful aventure, and this one is not an exception. Note also that, August 2, ESO will communicate to the world a press release with some of the great images we have obtained. I will close this blog for some time. It was great to share with all of you this moments. This is already the second episode of the series: first light and commissioning of MUSE stand alone was the first one (see here). But wait, this is not the end, in hardly a year we will be back to continue our adventure, with the expectation to push forward the system to another level: the so-called MUSE narrow field mode will be coupled with a full laser tomography adaptive optics system. 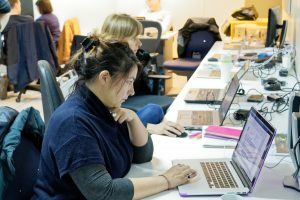 The aim is to improve the sharpness of MUSE images by almost an order of magnitude in a small field of view and we expect exciting results when scrutinising astronomical objects. Stay tuned, we will be back ! Time for me to say goodbye. 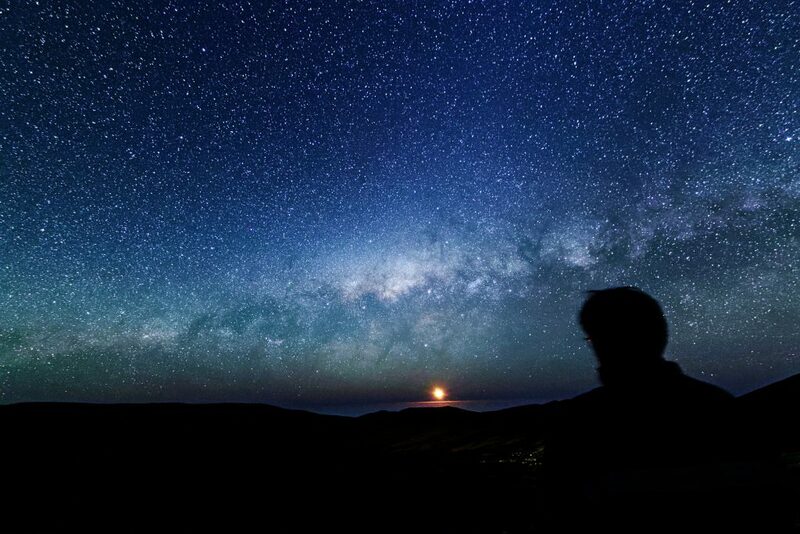 I am just a poor lonesome astronomer … (photo Simon). Clouds over the pacific at sunset (video Johann). Tonight, I have seen it. Not only me, most of us have seen it. Like you, I had doubt that it exists. There were rumours but nothing more. Some time ago I met an old man who told me that he has seen it. He gave me a lot of details, but can we trust a foreigner ? Peter and Gerard are looking to the big snake (photo Roland). Johann is wondering if it is dangerous (photo Roland). The night was clear. After some observations of a quasar fields, we were forced to leave the place because of risk of collision. We then move to south and catch NGC 5694, one of the usual southern snake species. At 6:25 UT the wind went down and Peter suggest that we move to a ULIRG, an ultra luminous infrared galaxy. We found a nice one, with a lot of jets. Benoit is already hypnotised by the monster (photo Roland). We were busy measuring the complex gas structure while I notice something moving fast in the background. We slowly approach the place and suddenly, I saw it. It was slithering in front of me, huge, almost two arc seconds at the top and less than 0.7 arc second at bottom. On its off state, it was almost filling all our field of vision while on its on state it shrinked in a minuscule spot. But the wind got up again and it started to become dangerous. We just had time to took a picture before leaving the place. At the end of the night we safely went back to the residencia and went to sleep, trying to forget the monster. One night at UT4 (video Johann). 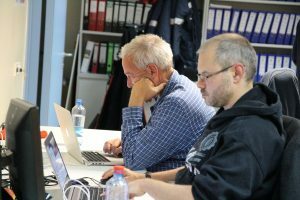 Thierry and Lutz are studying the freshly obtained data sets to develop image quality indicators. Study atmosphere in the control room. Tonight we perform many tests to check the functionalities and the robustness of the system. We also did as usual a number of on/off sequence to measure the performance of the system under different atmospheric conditions. At the end of night we had performed most of the planned tests and accumulated tons of data cube that have filled all the available computer disk space. And, icing on the cake, the problem with the offset sequence was solved thanks to Joel, Johann and Pierre-Yves who spend their last 5 a.m neurons to demonstrate that a cos(delta) was missing in the sequence. Shooting in clear sky patches (photo Roland). The AO on-off sequence, aka the snake, is back. After the first chaotic night, the team is seeking for a revenge. At the start of night we launch the lasers, ignoring Paranal’s desperate attempt to intimidate us with some clouds. Captain Pierre-Yves is at the command of the deformable secondary mirror (DSM). Right hand up: “too much tilt on the right, please turn left” (Photo Roland). A few clicks and the familiar images of the four laser pineapple slices show up, the tip/tilt star is catched within a second in the field selector box, loops are closed and after a few seconds of suspens … the snake is back ! Then we follow our long program, did a lot of tests, all successful, and get many great data sets. Simon, our snake hunter, has just flushed out a new specie (photo Roland). Even in these less than ideal conditions, we can measure the improved performance given by the system. We also obtain a beautiful on/off exposure of a planetary nebulae. Great images, but sorry, you will have to wait for the ESO press-release to see them (expected late July, early August). 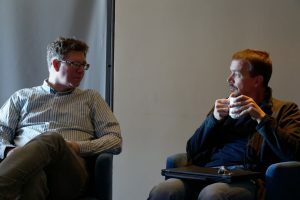 Harald and Joel discussing cosmic laser collisions (photo Roland). All the team is focused to maintain the machine at full speed. Gigabytes of data are coming out. Outside the laser ballet illuminate the sky. It is 6 am at the clock, the pale glow in the east announce the sun rise. Already ? What a great night !! Happiness in the control room for this smooth and successful night. In the foreground: Fernando, Yara and Harald (photo Roland). The direction is clear but the road can be bumpy (Photo Roland). 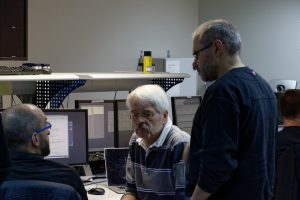 After a short break of 3 weeks, we are back in Paranal for the second and last commissioning run of MUSE with the Adaptive Optics Facility Ground Layer Mode. 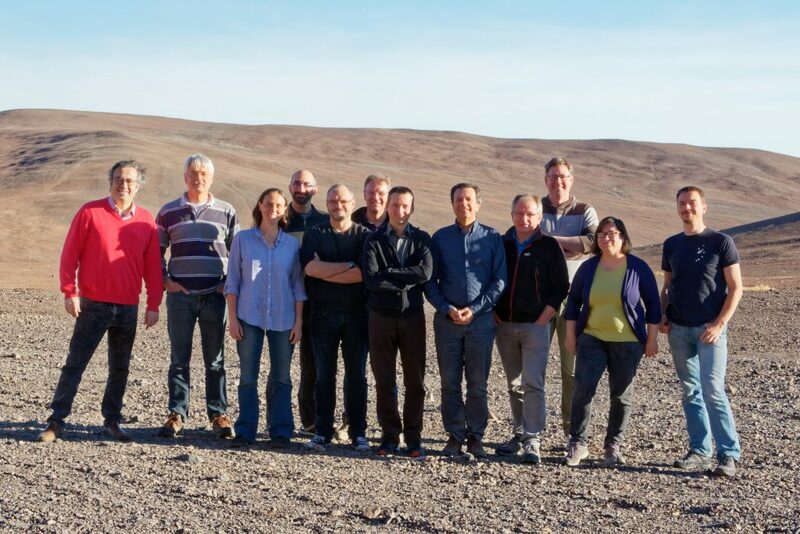 We are a large team of 14 people (from ESO Garching and ESO Paranal in addition to a few MUSE consortium members), but still not many with respect to all those who have been worked on the project for so long. While the sky turn from purple blue to red as we approach sunset, the team, full of energy, is moving to the VLTI control building. Nous voilà … lasers, wavefront sensors, MUSE be ready, sky is ours ! 04:05 UT: start again with MUSE GALACSI tests… – new acquisition (M75) – the acquisition went well: no issue – the goal is to have 6 successive open-close loop to measure performance, with a last one using the commissioning camera; after the second cycle, the main process of SPARTA died; HO loop was closed and everything else OK; Gerard suspects this might come from the FITS Header data collector; SPARTA main restarted; data collector of SPARTA parameters disabled. Not many sky data tonight: no planets, no galaxies, little stars and zero planetary nebulae. We still manage to obtain a few on/off sequence to measure the improvement of image quality. Still great, ouf ! “The wise man learn from his mistakes” wrote Confucius. At the end of this long night, we feel much wiser than yesterday. Times to go to bed. Paranal sky has been at its best for our last night of this run: perfectly clear and with enough ground layer to enjoy the power of the AOF. 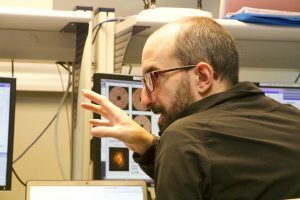 We focused on performance assessment, looking to star’s cluster at various places and measuring the improved image quality when we turn on and off the adaptive optics system. We also took some longer exposure to measure the laser background impact. A first quick analysis of the system performances gives us confidence that we will achieve a significant improvement of image quality most of the time. This will open a new discovery space for MUSE. 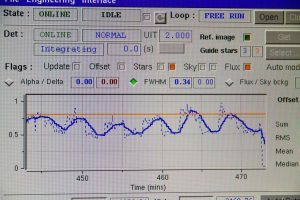 Thanks to AOF and Paranal experts, the robustness of the system has been much improved during this first commissioning. There is nevertheless still a number of open actions and we will be back in two weeks for another commissioning run. The AOF magician Johann is invoking the laser power (photo Roland). It is time for us to leave. 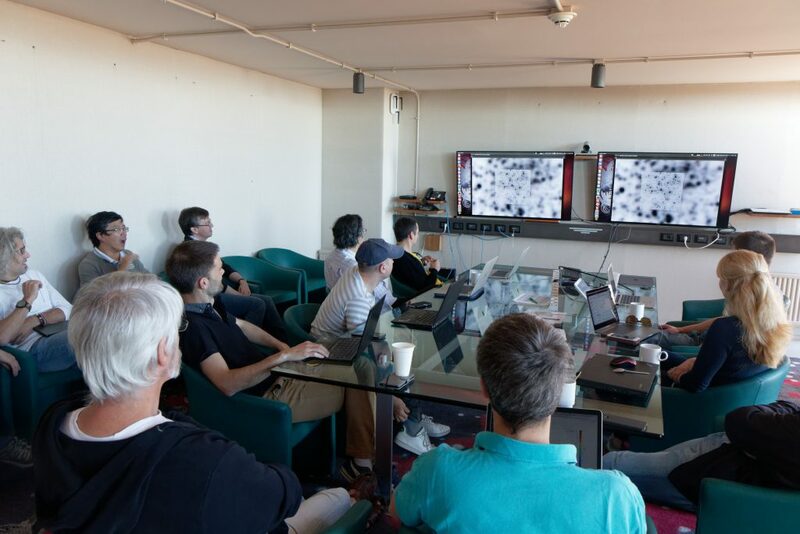 Thanks to all of you – Elena, Fernando, Gérard, Joel, Johan, Johann, Pierre, Peter, Ralf, Sebastian – for all the work performed in a very nice and constructive atmosphere. The commissioning team is tiny part of a group of many talented people which have been working hard for many years to achieve this fantastic results, the list is too long to be written here, but I want to warmly thank all of you. Thanks also to the Paranal staff for its hospitality and support. It has been a great experience to share and we enjoyed so much the laser show in the magnificent sky of Paranal. Laser traffic upon UT2 (photo Peter). Stay tuned, we will be back on July 13th. 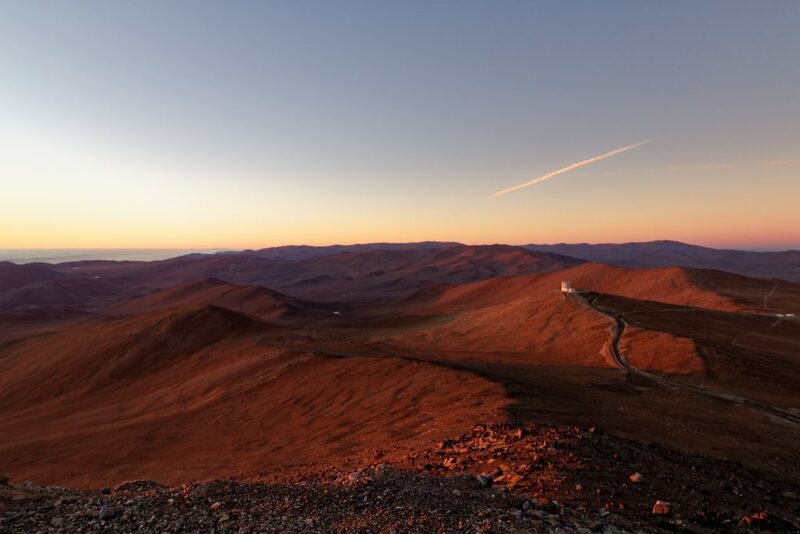 At sunset, Paranal sky shows its intention to cooperate, and indeed, it did all night. After a look at the beautiful sunset, we did not even wait for the sky to be fully dark and could start the big laser show. The laser is of course the most obvious part you see when you are on the platform. But it is only a subset of the AOF, a fantastic master piece of technology. 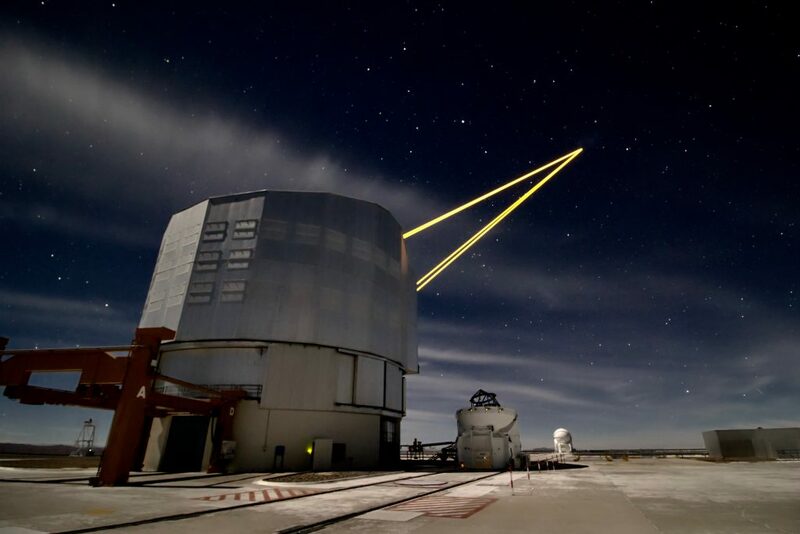 A typical observation always start by pointing the telescope to the target and then shaping the primary mirror to the correct optical surface to produce sharp images (the so-called active optics system). Then the laser show starts. First the beam is propagated and hits the atmospheric sodium layer at 90 km above, producing four artificial stars. The four wave-front sensor cameras are then pointed to the laser guide stars. The field selector is then moved to the selected natural tip/tilt guide star and locked to it. The full analysis of the atmospheric turbulence is then performed using these 5 guide stars. Information is processed in real time, 500 times by second, and the computed correction is sent to the secondary deformable mirror. This mirror of 1 m diameter and only 2 mm thickness, is levitating, linked to its support only by active magnets. The deformation of the mirror then corrects the light entering MUSE, producing even sharper images. The closing of the numerous loops to control this complex system is performed in 2 min. Impressive. And then you can monitor the system on the numerous screens. AOF GALACSI monitoring screen displays in real time the shape of the deformable secondary mirror (lower right), the tip/tilt star (lower left) and the four laser wave front sensors (upper-left panels). Video Roland. After performance measurements on a globular cluster, we went to some deep sky exposures to evaluate the impact of the lasers on the background. 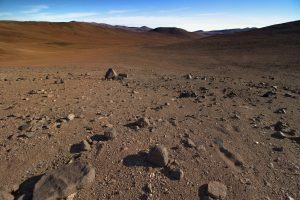 There is no moon, time to go to the platform and contemplate the millions of stars of the Paranal sky. These four bright light sabers pointing to the target add a surrealistic touch to this fascinating landscape. 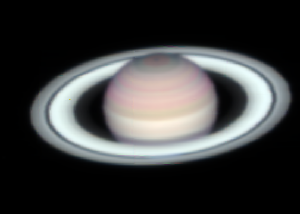 Reconstructed color image of a short exposure (1 sec) of Saturn (image Peter). This night was very productive, we obtained many gigabytes of excellent data over various targets. In the middle of the night, we even did a stop to greet the lord of the rings. At six in the morning, after this successful long night, it is time to take some rest before the next one.